For thunderstorms, outflow tends to indicate the development of a system. Large quantities of outflow at the upper levels of a thunderstorm indicate its development. Too much outflow in the lower levels of a thunderstorm, however, can choke off the low-level inflow which fuels it. Squall lines typically bow out the most, or bend the most convex outward, at the leading edge of low level outflow due to the formation of a mesoscale high-pressure area which forms within the stratiform rain area behind the initial line. This high-pressure area is formed due to strong descending motion behind the squall line, and could come in the form of a downburst. The "edge" of the outflow boundary can often be detected by Doppler radar (especially in clear air mode). Convergence occurs along the leading edge of the downdraft. Convergence of dust, aerosols, and bugs at the leading edge will lead to a higher clear air signature. Insects and arthropods are swept along by the prevailing winds, making them good indicators of the presence of outflow boundaries. The signature of the leading edge is also influenced by the density change between the cooler air from the downdraft and the warmer environmental air. This density boundary will increase the number of echo returns from the leading edge. Clouds and new thunderstorms also develop along the outflow's leading edge. This makes it possible to locate the outflow boundary when using precipitation mode on a weather radar. Also, it makes outflow boundaries findable within visible satellite imagery as a thin line of cumuliform clouds which is known as an arcus, or arc, cloud. The image to the right depicts a particularly strong ouflow boundary ahead of a line of storms. Often, the outflow boundary will bow in the direction it is moving the quickest. The development of a significant mesoscale convective complex can send out a large enough outflow boundary to weaken the cyclone as the tropical cyclone center moves into the more stable air mass behind the leading edge of thunderstorm outflow, or outflow boundary. Moderate vertical wind shear can lead to the initial development of the convective complex and surface low similar to the mid-latitudes, but it must relax to allow tropical cyclogenesis to continue. While the most obvious motion of clouds is toward the center, tropical cyclones also develop an upper-level (high-altitude) outward flow of clouds. These originate from air that has released its moisture and is expelled at high altitude through the "chimney" of the storm engine. This outflow produces high, thin cirrus clouds that spiral away from the center. The clouds are thin enough for the sun to be visible through them. These high cirrus clouds may be the first signs of an approaching tropical cyclone. As air parcels are lifted within the eye of the storm the vorticity is reduced, causing the outflow from a tropical cyclone to have anticyclonic motion. If two tropical cyclones are in proximity to one another, the outflow from the system downstream (normally to the west) can hinder the development of the system upstream (normally to the east). 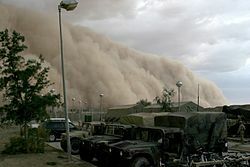 A sandstorm (Haboob) approaching Al Asad, Iraq, just before nightfall on April 27, 2005. Low-level outflow boundaries from thunderstorms are cooler and more moist than the air mass the thunderstorm originally formed within due to its wet bulbing by rain, forming a wedge of denser air which spreads out from the base of the parent thunderstorm. If wind speeds are high enough, such as during microburst events, dust and sand can be carried into the troposphere, reducing visibility. This type of weather event is known as a haboob, and is most common in the late spring within Sudan. Upper-level outflow can consist of thick cirrus clouds which would then obscure the sun and reduce solar insolation around the outermost edge of tropical cyclones. ^ National Weather Service (2009-06-25). "O". National Oceanic and Atmospheric Administration. Retrieved 2010-04-09. ^ Peter S. Parke and Norvan J. Larson (2005). Boundary Waters Windstorm. National Weather Service Forecast Office, Duluth, Minnesota. Retrieved on 2008-07-30. ^ Diana Yates (2008). "Birds migrate together at night in dispersed flocks, new study indicates". University of Illinois at Urbana - Champaign. Retrieved 2009-04-26. ^ Glossary of Meteorology (June 2000). Line echo wave pattern. Archived 2008-09-24 at the Wayback Machine American Meteorological Society. ISBN 1-878220-34-9. Retrieved on 2009-05-03. ^ John A. Knaff and John F. Weaver (September 2000). "A Mesoscale Low-Level Thunderstorm Outflow Boundary Associated with Hurricane Luis". Monthly Weather Review. American Meteorological Society. 128 (9): 3352–3355. Bibcode:2000MWRv..128.3352K. doi:10.1175/1520-0493(2000)128<3352:AMLLTO>2.0.CO;2. ^ University of Illinois (1999-10-04). Hurricanes. Retrieved 2008-08-17. ^ National Weather Service (September 2006). "Hurricanes... Unleashing Nature's Fury: A Preparedness Guide" (PDF). National Oceanic and Atmospheric Administration. Archived from the original (PDF) on 2008-02-26. Retrieved 2010-04-09. ^ Atlantic Oceanographic and Meteorological Laboratory, Hurricane Research Division (2004-08-13). "Frequently Asked Questions: What's it like to go through a hurricane on the ground? What are the early warning signs of an approaching tropical cyclone?". National Oceanic and Atmospheric Administration. Retrieved 2006-07-26. ^ Dr. Harold P. Gerrish (1989). "Preliminary Report: Tropical Storm Iris - 16–21 September 1989". National Hurricane Center. Retrieved 2010-04-08. ^ John F. Weaver (June 1982). "History of Thunderstorm Forecasting: Part VI: The Thunderstorm (to 1900)". Storm Track. 5 (6). Archived from the original on 2010-12-01. Retrieved 2010-04-22. ^ Western Region Climate Center (2002). H. Desert Research Institute. Retrieved on 2006-10-22. ^ Glossary of Meteorology (June 2000). "Haboob". American Meteorological Society. Retrieved 2010-03-27.